Marine Lubricants Market size was above USD 4 billion in 2016 and expects to surpass consumption of 3.5 million tons. Positive indicators towards growth in shipbuilding industry is anticipated to drive marine lubricants market. Strong application potential owing to high films strength which results in corrosion resistance and improved equipment reliability is likely to product demand in shipbuilding industry. Growth in seaborne trade across the world is anticipated to spur business in future. Globally, over 80% of trade is done through seaways as it is the most cost effective medium as compared to airways and roadways. Global seaborne trade was over 10 billion tons in 2015 of which dry bulk shipment was over 4.5 billion tons in the same year. Dry bulk shipment consists of bulk commodities which includes crude oil products, iron ore and grains. Increasing tourism activities coupled with recreational sports and cruising activities will also support marine lubricants market growth. Global recreational ships market should exceed USD 25 billion by 2023 owing to growth in consumer spending for leisure and recreational activities. U.S recreational boats sales was valued at over 10 billion in 2015 and accounted for a maximum chunk of the global demand. Increasing adventure sports and leisure and rising demand for luxury cruises should stimulate industry growth. Stringent government regulations regarding sulphur and nitrogen bio based marine lubricants market during the forecast period. When compared to petroleum based products, bio based lubricants produce fewer emissions due to higher boiling temperatures ranges of esters. It also reduces operational cost over the lifecycle of ship due to less maintenance, storage, and disposal requirements. Increase in the offshore drilling activity to meet growing requirement of crude & petroleum based product from refineries & chemical industries should drive marine lubricants market size. Various oil & gas manufacturers engaged in drilling projects to find offshore deep water hydrocarbons which should favour the product demand. Base oil and additives are key feedstock used in the manufacturing process. Base oil price, a petrochemical derivative, is highly dependent upon crude oil index. Crude oil index fluctuation may affect base oil base oil availability which may impact marine lubricants market price trend. Marine lubricants market size from mineral oil should surpass USD 4.5 billion at the end of forecast period. Strong application scope in turbines, engines and stern tubes owing to easy availability and being cost effective with respect to other counterparts should boost mineral oil demand. These products are performance enhancing and incorporate smooth movements in ship parts. 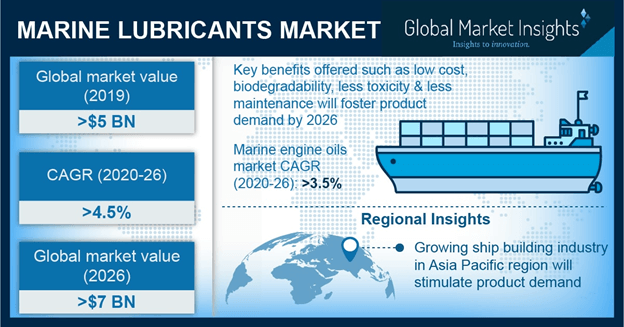 Synthetic oil based marine lubricants market size will witness growth over 4% by 2024. They offer benefits like better tolerance at extreme temperatures. However synthetic oil based products are expensive than other counterparts due of processing involved in production of these pure chemical base oil. Synthetic oil offers numerous benefits which includes low friction, wear & tear resistance, thermal stability, and good carrying load capacity over traditional lubricants which are beneficial for large shipping and commodity transport application. Marine lubricants market size from engine oil applications should be worth over USD 1.5 billion by 2024. These products are highly effective for four stroke and two stroke engines of large size ships such as cargo & cruise. Increasing shipping tourism along with rising disposable income mainly in India, and China should boost engine oil demand. Marine lubricant market size from grease applications is should grow over 3% by 2024. It is used in wide range of applications such as bearing, deck and gears. They are effective solutions possessing high load carrying properties and water splash pressure and high corrosion resistance. They can also increase the machinery output by raising overall efficiency of the engines and component parts. Marine lubricants market size from transport ships should surpass USD 3.5 billion by 2024. Transport ships may witness significant gains owing to growth in demand for consumer goods and bulk commodities. Growth in foreign trade activities favouring from various bilateral treaties along ports & infrastructure development and better navigation facilities may act as a major contributing factor for product demand. Tankers are important segment for transportation ships and may witness significant gains at over 3%. These are merchant vessels which are required to transport chemicals, gasses and liquids in bulk. Increasing petrochemical derived products demand in bulk quantities owing to rapid industrialization and growth in energy needs should stimulate marine lubricants demand for tanker ships. Recreational shipping segment is should witness growth over 3% by 2024. Increasing population along with positive outlook towards tourism industry is likely to favour recreational boat industry thereby stimulating marine lubricants demand. Rise in water and leisure sports participation due to rising economic standards and sponsorships mainly in U.S is likely to boost industry growth. Europe marine lubricants market size, led by Netherland, Germany and UK, should witness gains at over 3%. Growing seaborne trade due to bilateral agreements in nations along with rising investments and should drive regional industry growth. Increase in natural gas & crude oil production along with rising offshore exploration may act as another contributing factor towards product demand. China marine lubricants market size is fuelled by shipbuilding industry as the government has provided four state-owned operators with scrap and build subsidy. The subsidy policy of China will be executed till the end of 2017. To get benefits of this subsidy Chinese operators will have to scrap old ships and place a fresh order which will replace the vessel. This factor should positively influence regional industry growth. Brazil marine lubricant market size should grow at over 4% by 2024. This can be attributed to rise in national well as international seaborne trade in Brazil and has also announced its plan to set up ‘Hidrobras’, a new entity to look after Brazil’s inland waterway ports, and terminals. Brazilian government is also working on restructuring of marine ports and maintenance of waterways to cover the underutilized waterways in country. This will result in addition of vessels in country thus leading to increased product demand. Global marine lubricants market share is capital intensive and consolidated. Valvoline Inc., Lubricon, ExxonMobil, Shell, Sinopec, Total S.A, Castrol, Synforce lubricants, Baileys, LUKOIL, Quepet, Gulf Oil and Indian Oil are some of the industry participants. Capital intensive nature of business has resulted in high barrier limited the new entrants. Research efforts are being made for development of biobased marine lubricants to meet stringent government regulations and gain competitive edge. Marine lubricant is required to overcome friction and have smooth functioning between different operating parts with increased output efficiency. They help various components to smoothly perform operating functions with reducing the friction, wear & tear and machine maintenance cost. They consist of bio based, synthetic and marine oil and are crude or vegetable oil. They mainly comprise of base oil and additives. Key properties include reduction in energy consumption, minimize operational cost and increase equipment lifespan. Rise in seaborne trade activities owing to low transportation & maintenance cost and with presence of substantial number of shipping industries should drive product demand.